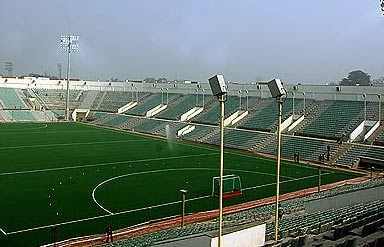 Delhi is home to some of the finest stadiums in the country. Providing world class facilities, the stadiums serve as the venue for small and big sports events. The international event, Common Wealth Games 2010, was held in the stadiums of Delhi. 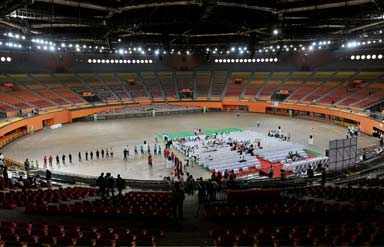 The opening and closing ceremonies were held at the Jawaharlal Nehru Stadium which was the main stadium of the event. It is one of the most famous stadiums of the country which even hosted the international Common Wealth Games in the year 2010. Located on Lodi road, it is one of the biggest stadiums of the country. It was established by the government of India in the year 1982 to host the 9th Asian Games. Due to the Common Wealth Games, it was given a facelift in 2010. It got its name from the first Prime Minister of India, Jawaharlal Nehru. A variety of entertainment events are also organized here. It can accommodate around 130,000 people. It also has the headquarters of the Indian Olympic Association. This stadium is known for hosting contests of badminton, gymnastics, volley ball, etc. The gymnastics events of the Common Wealth Games of 2010 were hosted here. 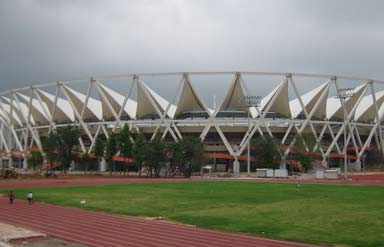 Built in 1982 to host the indoor sports events of the Asiad Games, this stadium sprawls over an area of 102 acres. Over the years it has undergone renovation several times. It has been divided into two equal halves by a fireproof and soundproof synthetics wall. It has a seating capacity of 25,000 persons. It is well equipped with various facilities such as lighting, audio, etc. This stadium was built for hosting contests of Squash, Badminton and Weightlifting. It is also a sports club offering swimming pool, badminton courts, skating rinks, fields for football, cricket and hockey. It is located on Siri Fort Road in south Delhi. This sports complex hosts archery and table tennis events. It is owned by the Delhi Developmental Authority and has a capacity of accommodating 4,297 persons. It is located near the good locality of Yojana Vihar. This complex is known for hosting Aquatics. It houses both swimming and diving pools. It is located on Talkatora road in the city. It is a popular hockey stadium of the city located near India Gate. Named after the famous Indian Hockey player Dhyan Chand, this stadium is also known for cricket coaching. The first Asian Games in 1951 were held here. It also serves as a venue for various marathons and rallies. Located near Gole Market, this stadium is famous for hockey games. Located on the Willingdon Crescent Road, this stadium is mainly famous for hosting Basket Ball and Table tennis events. It also has a separate section for archery. It is a well maintained stadium where music concerts, cultural programs, political seminars and quiz contests are also held. This stadium is for Football events. 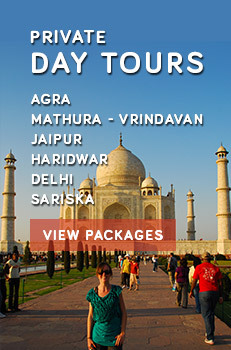 It is located in the Delhi Gate area of the city. It has a seating capacity of 20,000 people. This stadium was built in 1883 and hosted the first test match in the year 1948, when India played against West Indies. After that, several cricket matches were held here. It was named after the emperor Feroz Shah Tughlaq who ruled over Delhi from 1351 to 1388. It is located on Feroz Shah Kotla ground on Bahadur Shah Zafar Marg.